"This recipe comes from my sister-in-law. 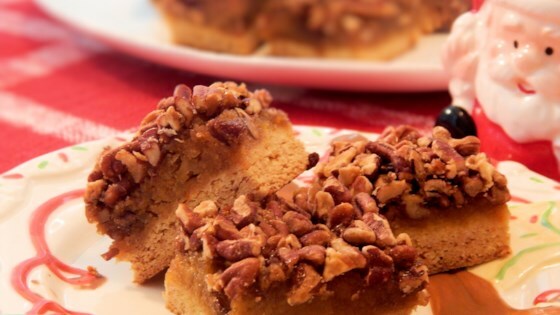 These taste like the best pecan pie you could ever eat, except you don't need a plate and fork." Preheat oven to 350 degrees F (175 degrees C). Lightly grease a 9x13-inch cake pan. Set aside 1 cup cake mix to be used for filling. Mix remaining cake mix, butter, and 1 lightly beaten egg together in a bowl until crumbly; press into the prepared pan. Bake in the preheated oven until crust is lightly browned, about 12 minutes. Combine brown sugar, corn syrup, 3 eggs, and vanilla extract together in a bowl; add the reserved 1 cup cake mix and stir until well blended. Spread mixture evenly over crust and top with pecans. Bake in the preheated oven until filling appears to be set when gently shaken, 25 to 30 minutes. Cool completely before cutting into bars. White cake mix can be used with no discernable change in flavor. I usually cut into 1x2-inch pieces, but that is up to you.